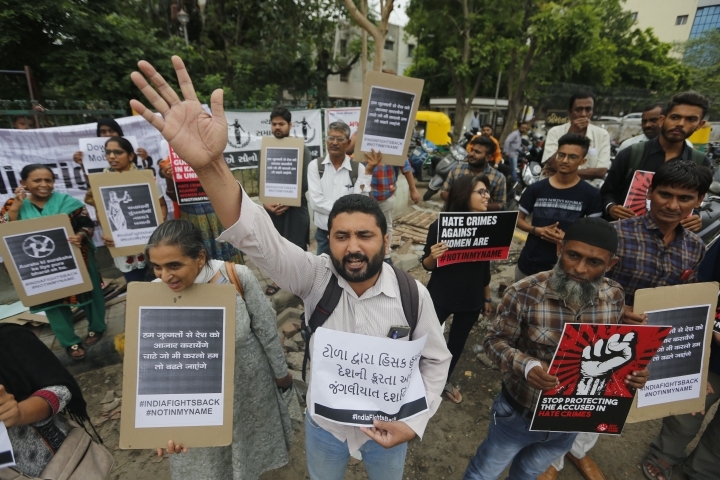 NEW DELHI — A woman was lynched in central India on rumors that she was part of a gang that kidnapped children, police said Monday, days after the highest court called for immediate steps to control deadly mob violence across the country. The Indian government announced Monday that it is setting up two committees to recommend appropriate ways to deal with the growing mob violence. At least 14 people were arrested in Madhya Pradesh state's Singrauli district following the killing of the woman, who was about 25, senior police officer Riyaz Iqbal said. Iqbal said residents informed police on Saturday that a woman's body was lying in a forested area. Police recovered the body, which bore multiple injury marks, he said. An initial investigation showed that she had been taken Friday night by a mob which dragged her to a village community center while punching and kicking her and hitting her with sticks. Iqbal said the woman was seen roaming around neighboring villages a few days earlier amid wild rumors that members of child kidnapping gangs were active in the area. The officer said the woman had not yet been identified. "She was not able to properly communicate with the mob and in all probability appears to have been mentally unsound," he said. India has a long history of mob violence, but in recent years, the internet and smartphones have aided the circulation of deadly rumors even to remote places. At least 25 people have been lynched and dozens wounded in mob attacks in the last three months over rumors that they were part of child kidnapping gangs. The victims were outsiders, mostly targeted because they looked different or didn't speak the local language. Although Indian authorities have stated that there is no truth to the child-lifting rumors and the victims were innocent, the brutal attacks, often captured on cellphones and shared on social media, have spread across the country. In addition, at least 20 people have been lynched and dozens wounded by Hindu extremists who call themselves cow protectors and are linked to Prime Minister Narendra Modi's Bhartiya Janta Party since the Hindu nationalist party won national elections in 2014. Most of the attacks by the so-called cow vigilantes have targeted Muslims, who make up 14 percent of India's 1.3 billion people. Hindus make up about 80 percent of the population. Cows are considered sacred by many Hindus, and slaughtering cows or eating beef is illegal or restricted across much of the country. The victims were accused of either smuggling cows for slaughter or eating beef. Lower-caste Hindus who carry out undesirable tasks such as skinning dead cattle have also faced mob violence. On Friday, a Muslim man was lynched in western India on charges of smuggling two cows. Indian opposition leaders expressed outrage Monday as broadcasters reported that police had delayed taking the injured victim to a hospital, leading to his death. "This is Modi's brutal 'New India' where humanity is replaced with hatred and people are crushed and left to die," opposition Congress party president Rahul Gandhi tweeted Monday, saying police took three hours to take the injured man to a hospital just 6 kilometers (about 4 miles) away. 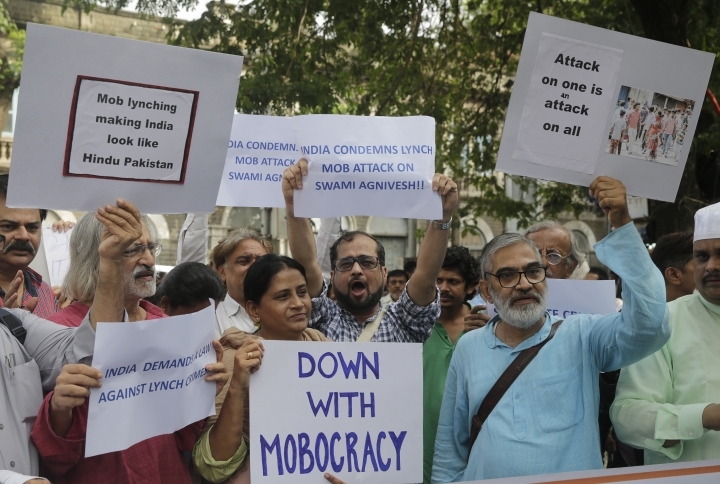 Rights groups and Muslims say government officials, including Modi, have been slow to condemn the attacks and that police action against perpetrators has been inadequate. 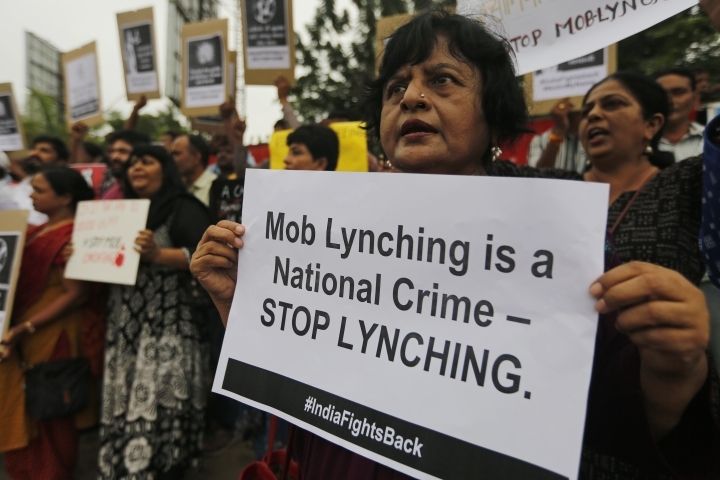 Last Tuesday, India's highest court asked the federal government to consider enacting a law to deal with mob violence. The Supreme Court directed authorities to take action against police or officials who fail to comply with the court's directive on pursuing such cases in a country where there is widespread distrust of the police and the courts, both of which are burdened by corruption and poor training. The committees set up on Monday will review existing laws dealing with mob violence and see if new provisions are needed in accordance with the Supreme Court's recommendations, media reports said. The country's top security official, Home Secretary Rajiv Gauba, will head one panel consisting of four government officials and will submit its recommendations to the second committee, made up of four Cabinet ministers, within four weeks, the reports said. The ministerial committee, headed by Home Minister Rajnath Singh, will report its final recommendations to Prime Minister Narendra Modi. The Indian government recently accused the Facebook-owned messaging service WhatsApp of fueling the deadly rumors. The service responded last Thursday by announcing restrictions on the number of groups to which a message can be forwarded. In India, the limit on forwarding is five chats at once, while for WhatsApp users outside India, the limit on forwarding will be 20.